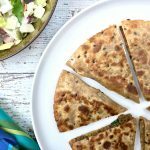 Indian spiced ground meat, ,keema, gets a Mexican makeover with these cheesy Keema Matar Quesadilla! Keema Matar is an Indian dry curry in which ground meat, called Keema, is cooked with peas and seasoned with toasted Indian spice blend, garam masala. 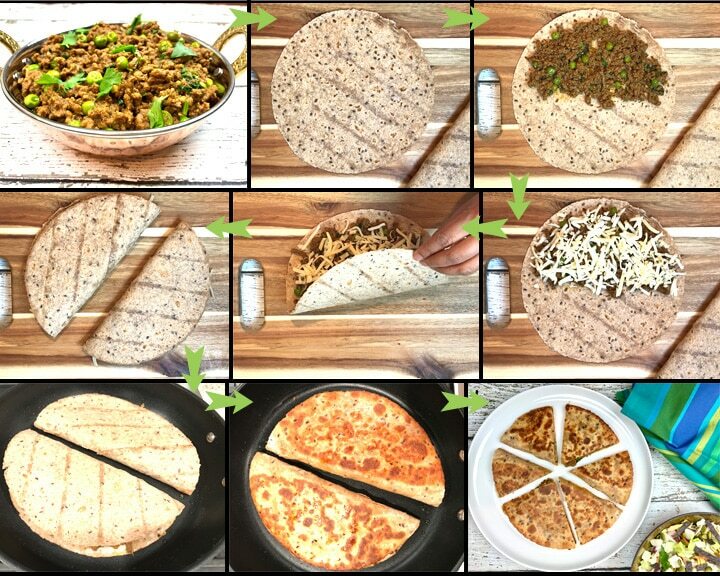 In this simple recipe, I spread pre-cooked keema on store-bought multi-grain tortillas, with a healthy sprinkle of shredded cheese, and grill the quesadilla till they are toasted and the cheese oozes out. 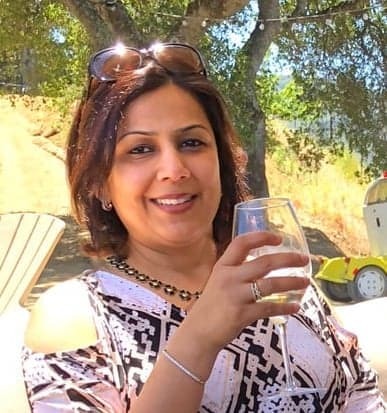 It’s a great way to enjoy our two favorite cuisines, Indian and Mexican, in the same bite. The simplicity and ease of this dish makes it a weeknight winner, and its delicious flavors and ease of eating makes it an entertaining hit, especially with kids. It is said that during the Mughal period, the royals used to serve keema on special occasions. For a detailed recipe for making Keema Matar, click here! 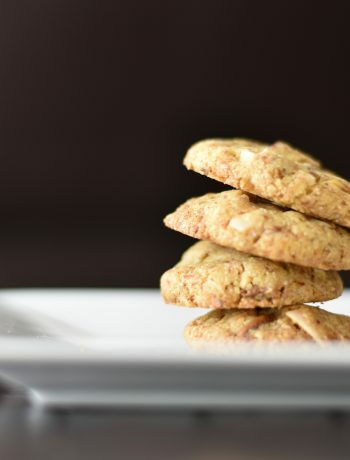 I am always looking for ways to jazz up classic dishes or fun ways to use left-overs. That’s how this dish was born! I had some left-over Keema Matar, and some flour tortillas lying around. I decided to put the two together and my family loved it. My kids love to take this for school lunches too. To make these delicious quesadillas, use your favorite brand of tortillas- flour or wholegrain. I use whole-grain tortillas with flax seeds from Trader Joe’s, they have a very nice earthy taste to them. Account for 1-1.5 tortillas per person. You will also need shredded cheese of your choice. I used shredded pepper jack cheese, it goes really well with the spiced meat. In this easy Quesadilla recipe, I spread the cooked meat on a tortilla, top it with some shredded pepper jack cheese, and grill it. How can you go wrong with that! Add the minced meat to one half of the tortilla. No other sauce required. If the meat just came out of the refrigerator, you may want to warm it in the microwave so that it is close to room temperature. Sprinkle cheese over the meat. The amount of cheese depends on how cheesy you like your quesadillas. Fold over the tortilla to make a half-moon shape. Add the quesadilla. Flip over after about 2-3 minutes and grill the other side. The cheese will melt and bind the tortilla together. Simply cut into slices and serve. 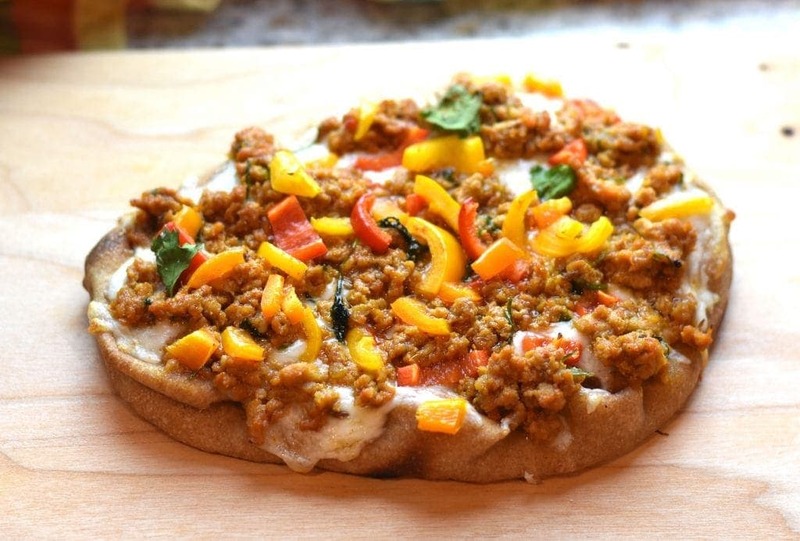 Another terrific dish to make with Keema Matar is Keema Naan Pizza. 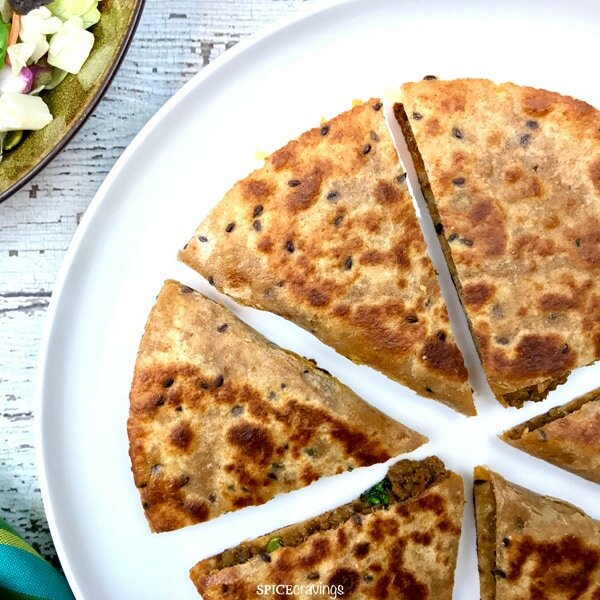 Indian spiced ground meat, keema, gets a Mexican makeover with these cheesy Keema Matar Quesadilla! Keema Matar is an Indian dry curry in which ground meat, called Keema, is cooked with peas and seasoned with toasted Indian spice blend, garam masala. Spread 1/4 cup Keema mix on one half of a tortilla. Sprinkle 2-3 tablespoons cheese on it. Fold over the tortilla in half as shown in the picture above. Heat a skillet on medium-high heat and drizzle some oil in it. Place the quesadillas in and cook for 2 minutes per side, or till golden brown. Remove from pan and cool for 2 minutes. Cut them into slices using a pizza cutter or a sharp knife. 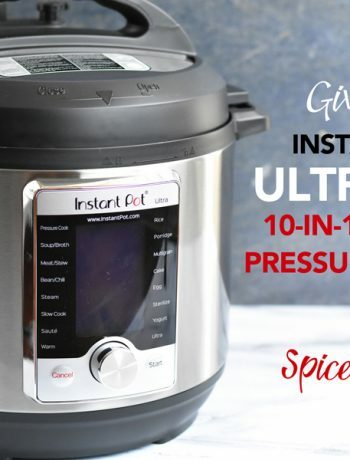 Serve with your favorite Mexican condiment- sour cream, salsa or a cabbage slaw salad!